The Puerto Rican Debt Crisis: Tax Breaks Offered to Rich While Austerity Measures Imposed on Poor | Democracy Now! professor, sociologist, historian, politician and a leading voice of the left in Puerto Rico. He ran for governor in 2012, representing the emerging Working People’s Party in Puerto Rico. The Obama administration recently warned Puerto Rico faces a humanitarian crisis unless Congress takes steps to address its crushing debt. 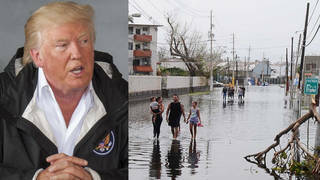 The White House wants lawmakers to approve bankruptcy protection for the U.S. territory, expand Medicaid and impose a control board to oversee Puerto Rico’s finances. We speak to Rafael Bernabe, a professor, sociologist, historian, politician and a leading voice of the left in Puerto Rico. He ran for governor in 2012, representing the emerging Working People’s Party in Puerto Rico. JUAN GONZÁLEZ: Well, Puerto Rican officials appeared before the Senate to push lawmakers to allow the U.S. territory access to Chapter 9 of the Bankruptcy Code. Puerto Rican Governor Alejandro García Padilla has said the territory’s debt of more than $72 billion is not payable, and he outlined a five-year plan to address the debt crisis. That plan includes raising tuition at the University of Puerto Rico, cutting investment in healthcare and contracting for-profit companies to run public road and ports. In return, the plan calls for debt restructuring that would require hedge funds and other creditors to voluntarily accept reduced payments. Padilla called on the hedge funds to come to the negotiating table. GOVERNOR ALEJANDRO GARCÍA PADILLA: [translated] Now, the most important conclusion from this plan is that even if we impose all the measures in it, it would not be sufficient to meet the needed equilibrium. The massive public debt of Puerto Rico is an impediment to growth. That’s why the time is now that the creditors come to the table and share the sacrifice. AMY GOODMAN: Thousands of public sector workers have protested against Governor Padilla’s austerity plan. Well, for more on the economic crisis in Puerto Rico, we’re joined by Rafael Bernabe. He is a professor, sociologist, historian, politician, leading voice of the left in Puerto Rico, ran for governor in 2012 representing the emerging Working People’s Party. He has co-written several books, including Puerto Rico in the American Century: A History Since 1898, and last year wrote a book in Spanish, Puerto Rico: Crisis and Alternatives. RAFAEL BERNABE: I’m very glad to be here with you. AMY GOODMAN: Explain this crisis to us. RAFAEL BERNABE: Well, the immediate aspect of the crisis, of course, is a debt crisis, the very high debt that the Puerto Rican government has adopted over the years. But behind the debt crisis lies the economic crisis. The economy of Puerto Rico has stagnated for the last 10 years. It hasn’t grown. It has lost about 25—25, 20 percent of the jobs that existed in 2006 do not exist anymore. And behind that lies the increasing—diminishing effectivity of the government economic policy, the basis of which is what we call the policy of tax exemption—the notion that you are going to attract U.S. investment to Puerto Rico by offering them no or very low taxes. So you have a paradox in Puerto Rico, which is that you have an economy that does not grow, does not create employment, does not create sufficient government revenue, and at the same time it’s very profitable for certain corporate interests. I mean, it’s about $35 billion in profits that are generated or declared in Puerto Rico every year and that leave the island. They are not reinvested in Puerto Rico, therefore they do not create employment in Puerto Rico, they do not create government revenue in Puerto Rico. And this is one of the major issues that stands behind the debt crisis. The government, over the years, instead of re-evaluating this tax exemption policy, which does not generate growth and allows these profits to leave the island, instead of reconsidering this policy, has preferred to borrow an ever-increasing amount of money. So now we have a double crisis: We have the debt crisis, and we have the economic crisis. We think that you cannot get out of the economic crisis if, among other things, you do not re-evaluate the tax policy that I just summarized. JUAN GONZÁLEZ: Well, but a lot of these economists who have been putting together papers in the U.S. analyzing what’s gone on in Puerto Rico are claiming that basically there has to be more austerity, restructuring. They especially point to the decline in the population, the fact that many public schools no longer are at capacity, and they’re basically urging a shrinking of the public school system in addition to increased tuition at the university. What’s your response to that? RAFAEL BERNABE: Well, I think, from the—let us say, the official sectors in Puerto Rico, the more powerful sectors in Puerto Rican society, there are basically two programs at conflict right now. One of them is the program of the creditors. It’s very well expressed in some of the documents they have produced. One of them is called “For Puerto Rico, There is a Better Way.” It’s a document you can find in the Internet. And it basically argues that the debt of Puerto Rico should not be renegotiated, it has to be paid in full. And in order to pay that debt, you have to impose very severe austerity measures, such as, you mentioned, closing schools, reducing the coverage of the health—public health insurance, increasing the cost of university education, reducing government employment, privatizing certain government agencies, selling off government property, so on and so forth. These policies would only increase the poverty of many people in Puerto Rico, and it would also perpetuate the economic crisis we have right now. The position of the government is that the debt has to be renegotiated, but unfortunately they mix that with their own austerity policies. So on that field, they are not different from the creditors. They want to impose severe austerity measures. And furthermore, their economic policy relies on an attempt to revive the tax exemption policy that I mentioned before, to go back to the way it was in the early—up until 1996, when you had both federal and local tax exemption. They tried to revive that model. So, we think that it’s an exhausted model. It’s not going to generate economic growth in Puerto Rico. The austerity measures are going to perpetuate the present economic crisis. So whatever relief they get on the debt side of the equation, it’s going to be annulled by the impact of these very severe austerity measures and this rather recycled and exhausted economic policy. JUAN GONZÁLEZ: And I wanted to ask you what Puerto Rico’s status has to do with all of this, because obviously in Congress now there’s an effort to get Chapter 9 bankruptcy available in Puerto Rico, because Puerto Rico is not treated like the other states, so it doesn’t have a clear path, legal path, out of its current quandary. And yet, at the same time, it’s not a country, that can formulate its own policies, devalue its money, for example, to get out of an economic crisis like this. So it’s caught in this limbo of being a U.S. possession but not a full state. RAFAEL BERNABE: Well, that definitely is part of the problems that we have, and we have to address. But although I have to say that one—I think one does too much of a favor to the present government by arguing that since Puerto Rico is a colony of the U.S., nothing can be done. I think that even within the existing framework, there are many things that the Puerto Rican government could do and doesn’t do. For example, it could tax some of the profits that now leave Puerto Rico. Even some legislators of the ruling party in Puerto Rico today, the Partido Popular Democrático, have presented legislation that would tax some of these profits, recuperate them for the Puerto Rican economy. AMY GOODMAN: Let me ask you if you have a critique of what the U.S. has done in Puerto Rico and if you think there should be reparations and what debt forgiveness would look like. RAFAEL BERNABE: Yeah, I think reparations is a very interesting concept to use in Puerto Rico. And I, as a historian, am always—I always remember there’s a sort of a precedent for this. In the 1930s, Vito Marcantonio, who was a progressive congressman from New York, who was very much interested in the situation of Puerto Rico, presented an independence bill and a bill to allow Puerto Ricans to vote whether they wanted to be independent or not. But interestingly enough, it included the notion that the United States could not simply, if Puerto Ricans wanted to be independent, give them independence. It also had to repair some of the damage done through the economic consequences of the U.S. presence in Puerto Rico. And I think that’s an important issue. Although I have to say that, for me, it’s very important to emphasize that when we talk about the need for federal input in an economic recuperation of Puerto Rico—sometimes people ask me, “But why should the United States invest money in reconstructing the Puerto Rican economy, when it doesn’t do that in the United States?” Well, my answer to that is: It should do that in the United States. Working people, people of color, poor people in the United States are suffering the consequences of several decades of terrible pro-business policies in the U.S. And it is not only Puerto Rico that needs a plan to reconstruct the economy in the interests of the majority. So that we feel that we must build a strong working class, working people’s movement in the U.S., in Puerto Rico. That includes a program, definitely, for Puerto Rico’s economic reconstruction, but not only for Puerto Rico. So it’s not—as important as solidarity is, I don’t only see it as people in the United States having a position of solidarity with the people in Puerto Rico, but working people here and working people in Puerto Rico struggling together for the type of economic policies that we need for our economies to grow, and to grow in the interest of the majorities, not to profit minorities. JUAN GONZÁLEZ: —is now in the United States, not in Puerto Rico. Their role in this crisis? RAFAEL BERNABE: Well, as you very well point out, one of the features of the Puerto Rican situation, Puerto Rican life over more than a century now, is that precisely because of the hardships in Puerto Rico—lack of employment in Puerto Rico, low wages in Puerto Rico—many Puerto Ricans moved to the United States in search of better pay or in search of jobs. And needless to say, that’s a very important component of our nation. And their role in our struggle is fundamental. As we confront the present crisis, we are going to be facing very strong creditors. Their offices are in Wall Street. We are going to be putting demands on Congress, which is in Washington, D.C. Federal judges may be going over the situation in Puerto Rico and taking very important decisions regarding debt negotiations. And the need that we have to mobilize to let all of these agencies know what Puerto Rico needs is something that we can do in Puerto Rico but also can be done in the United States, by Puerto Ricans in the United States, and not only Puerto Ricans, all working people, who I think have an interest in pushing for solutions to our problems, and the problems in the United States, in favor, as I said, of the working-class majorities. AMY GOODMAN: Finally, you did run for governor on the Working People’s Party. AMY GOODMAN: The Working People’s Party works within the system. What do you think the status of Puerto Rico should be? What do you think would improve its economic situation and overall? AMY GOODMAN: You’ve called for a radical change? RAFAEL BERNABE: —a radical transformation. But the workers’ party, the Working People’s Party, is not for independence or a socialist party, because we think, at this stage, working people in Puerto Rico, whether you are for independence, you are for statehood or you are for autonomy, we have to get together, as working people, in order to stop these austerity measures, for example, that they are trying to impose. These austerity measures have to be stopped now. We cannot wait ’til independence or statehood or any change of status. And these austerity measures are going to affect working people regardless of their status preference, as we call it. So we think that working people should get together, should have their own party. And we will have our own discussion, as working people, as to which status Puerto Rico needs. But right now, we have to get together, as working people, to stop these austerity measures and to propose a different way out of the present crisis. AMY GOODMAN: Rafael Bernabe, thank you very much for being with us, a professor, sociologist, historian, politician, leading voice of the left in Puerto Rico, ran for governor in 2012 representing the emerging workers’ party in Puerto Rico, has written a number of books, among them, Puerto Rico in the American Century: A History Since 1898. This is Democracy Now! I’m Amy Goodman, with Juan González. Thanks so much for joining us.